Country Inns & Suites By Carlson launches Military 1st, a program that honors service members with a preferred rate, the best available room at the time of check-in and other upgrades. In addition, Country Inns & Suites partners with Operation Gratitude through a letter writing campaign taking place at its more than 440 hotels in the U.S. The Military 1st program is available for active and retired military, veterans and their spouses and can be booked directly at Country Inns. com/military. A valid military ID must be presented at check-in. The offer is available at Country Inns & Suites hotels in the U.S. and Canada. In addition to a special rate, those who book the rate will receive automatic enrollment in the Club Carlson loyalty program with an upgrade to Silver Elite status after the first completed stay and the best available room at the time of check-in (subject to room availability at time of check-in). In partnership with Operation Gratitude, Country Inns & Suites has placed letter writing stations in all of its hotels throughout the U.S. and invites guests to write notes of thanks. Hotels will collect the letters and Operation Gratitude will deliver them to active and deployed service members. Signature brand amenities include free high-speed Internet, free hot breakfast, fitness centers, a Read It & Return Lending Library and business centers. Country Inns Military 1st rate. Many hotels, resorts, Bed and Breakfast inns offer savings for summer travelers, so you can take a trip without breaking the bank. Here are some lodging specials in West Michigan. Use code WMTA for the Radisson in Kalamazoo and receive 30 percent off your Sunday to Friday stay. Gull Lake View Golf Course & Resort in Augusta offers a Stay and Play special. Tee off from their new course, Stoatin Brae. Bay Pointe Inn in Shelbyville has a lodging special where you receive gift cards for every night you stay. Book two consecutive nights and receive a $25 gift certificate or receive a $50 gift certificate when you stay three consecutive nights. The Holiday Inn in Ludington and the S.S. Badger partner for summer savings. S.S. Badger passengers receive up to 20 percent off their stay when they show their ticket or receipt upon check-in. The Badger is a good way to across Lake Michigan and the Holiday Inn in Ludington can be your home base during your trip. The Muskegon KOA and Michigan's Adventure team up with the Michigan Adventure package from Sunday to Thursday nights. The package includes two nights of camping for two adults and two children, four general admission tickets to Michigan's Adventure, two boat rentals, and two banana bike rentals for $200, a 25 percent savings. The JW Marriott Grand Rapids specials include their JW Love package, Beer City USA package and Spa Escape package. The Ramada Plaza in Grand Rapids has packages for travelers. Packages can include golf at nearby courses, waterpark passes and tickets to Frederik Meijer Gardens. The Grand Hotel on Mackinac Island has packages and specials throughout the summer. With the Pure Michigan package, the more you stay, the more you save with discounts on second and third consecutive nights. Family Added Value Days are available select nights in August. The Summer Michigan Golf Live package gets you unlimited golf at the Jewel Golf Course, as radio and television show host Bill Hobson hosts the Michigan Golf Live. The Island House Hotel on Mackinac Island has a romance package that includes accommodations, roundtrip Mackinac Island Ferry tickets, a dining certificate with sparkling wine and a Mackinac Island fudge flight delivered to your room. Use code ROMR when booking. The Chilled Celebrate package at Chateau Chantal in Traverse City includes champagne, two champagne flutes to take home, $50 certificate for dinner, fresh flowers and a gourmet chocolate assortment. The unwind package includes two 60-minute massages, two embroidered robes and a bottle of wine. Stay at the Bay Harbor Village Hotel in Bay Harbor for one night and receive a second consecutive night at half-price, or stay two consecutive nights and receive the third consecutive night free, Sunday through Thursday only. Crystal Mountain in Thompsonville has a family package from $249 per night (based on a family of four). This package includes activities such as unlimited use of the Edge Adventure course, Crystal Coaster Alpine Slider, vertical edge climbing wall and disc golf. Applesauce Inn B&B in Bellaire offers their Stay Longer Special. Receive $15 off each night when you book three or more nights. There’s a farm-to-table breakfast, homemade dessert and a glass of Traverse City wine or cider. Tour operator Tripmasters offers a nine-night vacation to Prague, Vienna and Budapest from $969 per person, based on double occupancy. This price includes hotel accommodations, train transportation and airfare from New York, based on an Oct. 31, 2017 departure. The offer expires Dec. 31, 2017. and other departure dates and departures cities are available. The Sea Pines Resort, in Hilton Head, SC, offers summer golf specials for afternoon play on its three courses. You can play the Harbour Town Golf Links, host of the PGA TOUR’s RBC Heritage, Heron Point and the Atlantic Dunes courses until Sep. 17, 2017. The resort’s summer golf special rate for play after 1 p.m. is $389 per person to play all three championship courses or $199 per person to play Heron Point and Atlantic Dunes. The resort has a new mobile app for booking tee times and news on upcoming events and activities, exclusive offers, live entertainment schedule, restaurant reservations, and directions. You can download the app here. A wide array of accommodation options are available including 300 villas, 100 rental homes and the 60-room Inn & Club at Harbour Town. TravelCar, offering airport parking and carsharing for travelers, entered the U.S. market, selecting Los Angeles as its headquarters and Los Angeles International Airport (LAX) for its first U.S. operation. Founded in 2012 and operating in 30 countries in 200 locations, TravelCar provides travelers free airport parking and helps them earn money by renting out their car to other travelers while they are away. Car owners who agree their car can be rented by other travelers benefit from free airport parking. If their vehicle is rented, the car owner is paid for every mile driven. Owners can travel with ease knowing their car is protected with $1 million in liability insurance and is covered against theft and physical damage. If the car is not rented, they still benefit from free parking. Travelers looking to rent a vehicle can have access to a private car for up to 70 percent less than traditional rental car companies. TravelCar is open at its LAX location with expansion to San Francisco followed by eight additional markets this year. Massanutten Resort in Massanutten, VA, offers specials and packages. The Savor Your Stay package, from $357, includes two nights in a one bedroom studio condo that sleeps four and one $50 dining gift card. The Spa package starts from $332 and is available Sunday to Thursday. It includes two nights in a one bedroom studio condo that sleeps four and one $100 Spa Gift Certificate. The Mountain Bike Park package, from $396, includes two nights in a one bedroom studio condo that sleeps four and includes four Bike Park Trail Use Tickets. The Bike Park is open Wednesdays to Sundays in the summer. The mid-week Mini Splash package, available Sunday to Thursday only, starts from $357. The price includes two nights in a one bedroom studio condo that sleeps four, two discounted general admission tickets and all-day waterpark passes. The mid-week Mini Swing package, good Sunday to Thursday, starts from $447. The package includes two nights in a one bedroom studio condo that sleeps four and four discounted golf passes. The all-season resort features 6,000 mountain acres in the Blue Ridge Mountains which include the Ski and Adventure Park area, Mountain Greens Golf Course, LeClub Recreation Center, the General Store, and Mountain Peak Pool. The Visit Philly Overnight Hotel package returns for the summer with free hotel parking. Bookable now, the summer edition runs to Sep. 4, 2017. Available for a one- or two-night stay at more than 30 hotels in Center City and beyond, the summer deal includes the following with a combined value of $208. Two tickets and roller skate rentals at Summerfest (a $26 value). Visit Philly Overnight Hotel package. Tour operator, Craft Travel Group, offers 20 percent off eight-day Delfin River cruises regularly priced at $4,425. Prices start from $3,540 per person, based on double occupancy, for all 2017 departures booked by Aug. 15, 2017. Experience the Amazon on a small yacht river cruise with activities such as kayaking on the Amazon, Piranha sports fishing, a rainforest canopy walk or visiting a rescue rehabilitation center for river mammals. The trip includes time in Lima, Peru and highlights of the Incan empire in Cusco, the Sacred Valley and Machu Picchu. Unlimited activities aboard the Delfin including trekking, paddle boarding, kayaking and visits to local indigenous villages. Craft Travel Group or 800/553-9959. The Jerusalem Development Authority (JDA) launched discounts for young professional tourists visiting Jerusalem. Aimed at millennials in their twenties and thirties, the discount package offers reductions on hotels and transport, historical tourist sites, festivals and events, restaurants and bars. Whether traveling for business or pleasure, you can discover Jerusalem for under 40 Euros, or about $45 per day. Jerusalem has attractions for culture lovers and events and festivals that take place throughout the year. Through the package, you receive 50 percent off the second ticket at the Night Spectacular, a 45-minute show celebrating Jerusalem’s history through sights and sounds. It takes place amidst the archaeological remains in the David Citadel’s courtyard, and to the sound of original music, virtual reality images tell the stories of King David, the Roman conquest, Muhammad, the Crusaders, and Suleiman the Magnificent. Offers include a free tour of the Old City with Sandemans New Europe Tours and 50 percent off the second ticket at the Tower of David Museum, also known as David’s Citadel. In the modern city center, Jerusalem’s new neighborhoods offer night life and culture. For the eco-friendly, Segway tours are a popular way of seeing the city, and there are discounts on select Segway tours of Jerusalem’s modern neighborhoods. Two hostels and six hotels partner with the City Break Millennials package and offer a 15 percent discount or a free dinner: the Abraham Hostel, Eyal Hotel, Herbert Samuel Hotel, Ibis City Center Hotel, Post Hostel and Shani Hotel. All are located in the City Center and close to the Old City. Jerusalem's culinary scene is a fusion of ancient and modern recipes and techniques, where ethnicities mesh to create dishes that fuse European, North African, and Mediterranean cuisines. Food enthusiasts receive 50 percent off the BiteMojo card – a phone app that offers standalone self-guided food tours, allowing you to sample Israeli culinary delights while mixing with the locals at the Machane Yehuda Market. The market sells fresh produce by day and is an epicenter of nightlife after hours. Millennials receive a free alcohol shot at a number of bars, many of which are in Machane Yehuda Market. Hunting down the closest grocery store in an unfamiliar city is a thing of the past, thanks to Hawthorn Suites by Wyndham. Wyndham's extended stay brand gives easy access to the ingredients you need to feel at home on the road with its grocery delivery, bringing groceries to your hotel room door through partnerships with Instacart, a retail delivery service, and Peapod, an online grocer. The service is piloting at eight Hawthorn Suites hotels in and around Chicago IL. ; Philadelphia, PA; Raleigh and Charlotte, NC; Hartford, CT; and Orlando, FL. It’s to help long-term guests maintain their routines when away from home. It's the latest addition to Homemade @ Hawthorn®, the brand's in-room, chef-driven cooking program designed for hotel living serving up seasonal, home-cooked recipes from chefs which can be easily prepared in a fully equipped in-suite kitchen. With a few clicks online, guests at the pilot hotels can find and order all of the ingredients for their favorite Homemade @ Hawthorn recipe, or grocery items, and have them delivered straight to their hotel. Hawthorn Suites created a selection of new easy-to-make recipes whether travelers are hitting the road or firing up the backyard grill, available here. Each home-cooked dish, such as pub cheese and ham sandwich, pasta with vegetables, and a watermelon salad – was designed to be easily prepared in 30 minutes or less. A recent survey from Hawthorn Suites uncovered 66 percent of Americans, including 84 percent of Millennials, agree being able to cook in a hotel room would make them feel more at home when traveling. The same survey found comforting and familiar foods topped the list with 38 percent of respondents longing for baked goods, followed by pasta (31 percent) and salad (27 percent). Fleetway Travel offers its Lapland, Finland experience from $1,569 per person based on double occupancy from $1,569 for six nights. The trip includes airfare from New York, transfers, six night’s accommodation, snowmobile safari and daily breakfast. The $1,569 price is good for departures on Jan. 12, 19 and 26, 2018 and Mar. 2 and 9, 2018. The trip is offered January, February and March 2018 with other dates during that time frame at a higher price. The offer is subject to availability. The single supplement is from $1,999. One night at Scandic Grand Marina in a standard room. A summertime drive can result in a "brake-worthy" stop – to enjoy a beautiful scene, buy an ice cream cone or visit a loved one. In celebration of these special moments, Federal-Mogul Motorparts' Wagner Brake brand has the #ThingsWorthBrakingFor contest, where you compete for a weekend getaway package and other prizes by submitting photos and captions documenting brake-worthy scenes. The free contest is open for entries through Aug. 25, 2017. To highlight the importance of relying on high-quality brake components and service, Wagner Brake's #ThingsWorthBrakingFor contest will award one grand-prize two-person weekend getaway package to any of nine U.S. cities – Austin, TX; Boston; Charleston, S.C.; Chicago; Denver; Nashville; New Orleans; San Diego; or Seattle. Also available are free one-year subscriptions to an online music service for each of 10 honorable mention recipients. Contest winners will be selected on creativity, originality and photo quality. The #ThingsWorthBrakingFor grand-prize weekend getaway will include two roundtrip airline tickets, hotel accommodations for three nights and a $750 prepaid gift card. The contest is available in the 48 contiguous U.S. states, District of Columbia and Canada. You must be 18 years old or older to qualify. Wagner #ThingsWorthBrakingFor contest and official rules. Wyndham Extra Holidays, a subsidiary of Wyndham Vacation Ownership (WVO), offers summer travel deals to more than 40 resorts during the Wyndham Extra Holidays Summer Travel Sale. With more than 40 resorts to choose from, your family can relax in suites, with kitchens, bedrooms and separate dining and living areas. Book by Aug. 15, 2017 for travel by Sep. 30, 2017 and mention code SUM17. A two to five-night minimum stay is required, depending on resort selected. The offer is for new reservations only and is subject to availability. Reservations not valid over holidays and special events and cannot be combined with any other offer. The longer you stay at a Wyndham Extra Holidays resort, the more you can save with deals of up to 20 percent off. Here are a few participating resorts. Wyndham Clearwater Beach Resort — Clearwater Beach, FL. Bluebeard's Beach Club – St. Thomas, U.S. Virgin Islands. Wyndham Extra Holidays or 800/670-3620. Although new U.S. government regulations on Cuba travel have tightened, International Expeditions continues to offer authorized small-group people-to-people experiences and has discounts on its Cuba Voyage and Complete Cuba programs. Travelers on all 2018 Cuba Voyage departures will save $1,000 per person, while all remaining 2017 Complete Cuba tours are offered at a $350 per person discount. International Expeditions' Cuba Voyage cruises along the reefs and trails of western Cuba to Havana aboard the 46-guest yacht Panorama. You learn the history of the Isle of Youth, cigar rolling at a family run tobacco farm, chat with local artists and call on mechanics that maintain Cuba's classic cars. To ensure a high level of service, you travel with an Expedition Leader plus a cruise manager and local Cuban guide on excursions. Discounted pricing on the Jan. 18, Feb. 8, Feb. 15, Mar. 1, Mar. 29, Apr. 5 and Apr. 12, 2018 Cuba Voyage departures starts at $5,199. The Complete Cuba program takes you to the countryside for a look at daily life and discussions with musicians, artists, chefs, farmers and birders. In addition to visiting five UNESCO Sites, you join local naturalists for nature walks in Topes de Collantes National Park, Zapata Wetlands, the eco-community of Las Terrazas and Cuba's largest botanical garden. It’s an opportunity to spot some of the island's birdlife, including the bee hummingbird. Discounted pricing on the Sep. 28, Oct. 26, Nov. 2, Nov. 9, Nov. 30 and Dec. 14, 2017 departures starts at $4,448. International Expeditions first began offering licensed travel to Cuba in 2003. Island Destinations and IDX, The Power of Travel, offer deals on island destinations including Bali, Costa Rica, Punta Cana, Turks and Caicos, Hawai’i, Mexico, Bermuda, Maldives and the Caribbean. One&Only Reethi Rah, Maldives - savings up to $9,080 for a seven night stay in a two-villa residence with pool and a 60 minute massage and daily breakfast for two, two free nights, and free half board (breakfast and dinner). NIZUC Resort & Spa, Mexico - up to $1,150 in savings that include a three night stay in an ocean suite or garden pool villa with a guaranteed upgrade, butler service and one free night. The Shore Club, Turks and Caicos - family-friendly resort offers a seven-night stay in an oceanfront study with savings of up to $3,450 which include two free nights, daily breakfast for two, treehouse themed kids club, $250 in resort credit. Grand Velas Los Cabos, Mexico - new retreat offers savings up to $1,280 including a guaranteed upgrade, spa credit, and daily meals and beverages. Garza Blanca Preserve Resort & Spa, Puerto Vallarta, Mexico - savings up to $780, guaranteed upgrade, $100 resort credit and daily à la carte breakfast for two. The Landings Resort and Spa by Elegant Hotels, St. Lucia - savings up to $700, guaranteed upgrade at time of booking, $200 resort credit, daily free breakfast and free watersports. Paradisus Punta Cana, Dominican Republic - all-inclusive, all-suite resort offers savings up to $440 and guaranteed upgrade. These and additional extras are in the Island Destinations Ultimate Exclusives Brochure and the IDX Collection. Both brochures require an Adobe plugin. Club Med looks to entice you to one of their all-inclusive resorts around the world, with their WOW sale with up to $1,000 per person in instant savings and perks such as free room upgrades and air credit. Club Med resorts are located in the Caribbean, U.S., Mexico, Asia and Europe. WOW-worthy promotions include up to $1,000 per person instant savings on an all-inclusive escape to more than 30 resorts worldwide. The offer does not include airfare. Free waterskiing including equipment and instruction. Through Aug. 22, 2017, book your trip for travel through Feb. 17, 2018. Club Med includes all-day dining, unlimited beverages, more than 60 sports and activities, daily and nightly entertainment, spacious accommodations, and children's clubs for kids four years old and up. Sample savings are per person, based on double occupancy in a Club category room on select weeks at Ixtapa Pacific, Mexico and Punta Cana, Dominican Republic. Discounts on other dates, room categories and/or at other resorts may vary. A free room upgrade is available select weeks at Punta Cana, Dominican Republic; Cancun Yucatan, Mexico; Ixtapa Pacific, Mexico; Sandpiper Bay, Port St Lucie, FL; Turkoise, Turks & Caicos, and Columbus Isle, the Bahamas. Sample $400 air credit is per person, based on a seven-night stay in a Suite category room on select weeks at Cancun Yucatan, Mexico. Air credit is available for select resorts. Children between 13 and 15 years of age receive 60 percent of the air credit of an adult. Children between four and 12 years of age receive half of the air credit of an adult. Children under four do not receive an air credit. Credits on other dates, resorts, stay duration, room categories may vary. Club Med Columbus Isle, Bahamas. The International Cruise Victims Association (ICV) has worked with several members of Congress to initiate legislation that would correct a major injustice for fair and just compensation in the event of a wrongful death at sea. That work resulted in the Cruise Passenger Protection Act (CPPA). “I’m sorry, but your loved one’s life was worthless, economically speaking.” Imagine hearing those words while you are grieving the loss of your spouse, parent or child. Countless people have. Many suffered what professional mental health experts refer to as “secondary victimization” when their retired or minor aged loved one dies while on a cruise ship vacation. Why? Because of an antiquated, obsolete 1920 law known as the Death on the High Seas Act or DOHSA. This act, which was originally intended to be a sword for any claimant whose seafaring relative died due to a wrongful act, negligence or default on the high seas, has become a shield for the modern cruise line industry, according to Jamie Barnett of International Cruise Victims Association. In 1996, TWA Flight 800 crashed into the Atlantic Ocean, killing all on board, including 16 children. Because the plane went down approximately nine miles offshore of New York, DOHSA was applied, rendering the lives of 16 teenaged victims nearly worthless from a legal standpoint. Bereft and outraged, the family members of those victims sought to change that outcome, and with the help of Congressional representatives from Pennsylvania DOHSA §30307 was introduced. This remedy retroactively allowed compensatory noneconomic damages for “commercial aviation accidents” only. Unfortunately, the injustice of DOHSA’s original noneconomic damage prohibition was left intact for all maritime fatalities, due to intense lobbying by shipping interests, according to Ken Carver of International Cruise Victims Association. What does this mean for Americans? If you or someone in your family flies from Miami to London on an airplane and it crashes, legal action for compensatory noneconomic damages can be taken should the person dies. However, if the same person takes a cruise ship from Miami to London and dies because of poor medical care or other acts of negligence, no compensatory action can be taken. The DOHSA portion of this legislation would establish requirements for the cruise industry in line with those of commercial airlines. This needed and overdue remedy would ensure that families of cruise ship victims are able to pursue fair compensation after a death on the high seas in the same way families of airline disasters can. Princess Cruises offers special prices for third and fourth passengers to make it easy to bring family and friends onboard. For all Ocean Medallion Caribbean cruises on Regal Princess and Royal Princess, sailing November 2017 to April 2018, Princess offers a $99 price for third and fourth passengers. The offer is valid on interior, balcony and mini suite cabins on seven-day cruises and excludes holiday cruises. Prices for third and fourth passengers for 10-day cruises start from $199. Princess offers accommodations for families or groups traveling together. There is room for up to four guests in all types of staterooms, many with interconnecting options. The ships feature interactive games and family-friendly offerings. At Camp Discovery youth center, created with Discovery Communications, Princess offers programs and activities where kids and teens create keepsakes. Programming includes MythBusters science activities with hands-on challenges. As part of the cruise line's Discovery at Sea program, there are three center themes to participate in activities. The Treehouse, ages three to seven: A forest and animal-themed center with hands-on activities. The Lodge, ages eight to 12: Inspired by the outdoors, this center is filled with sports activities. The Beach House, ages 13-17: surf-themed lounge to hang out and socialize. There are concerts, sporting events and films at Movies Under the Stars, a 300-square foot poolside movie theater. Princess makes this experience more special with comfortable chaise lounges and cozy blankets in the evening. Ocean Medallion vacations on Princess Cruises or 800/PRINCESS. Most cruise reviews will tell you about a ship’s food, entertainment and public spaces. What you don’t see published is what happens during the booking process. The reason is the cruise reviews you read in guide books and publications are written by journalists who cruise and fly free or pay a journalists rate that’s a small fraction of the actual cost. Journalists rarely make their own arrangements for flights and sailings. All the legwork is usually done by the cruise line’s communications or public relations department. The accommodations journalists receive are usually the top tier available on a ship such as suites. Onboard journalists typically receive free internet, paid port charges and taxes, shore excursions, gratuities, alcoholic beverages and other amenities for free. This does not generally apply to cruise passengers who share their impressions of their cruise. So when we told you about our cruise on Holland America’s Volendam, we want you to know that we paid for our cruise: airfare, cruise, port charges and onboard expenses such as shore excursions, specialty restaurants, gratuities, and alcoholic beverages. We want to share with our readers the unexpected and frustrating aspects of the booking our cruise. This information will not be part of a guide book or publication’s cruise review. Our first encounter with Holland America felt like a bait and switch. Holland America offered an Explore 4 promotion. If you booked a cruise by a certain date (which we did) and sailed on a select cruise from January 2017 through April 2018 (which we did), you received up to $400 onboard spending money, a signature beverage package, a Pinnacle Grill dinner, reduced fares for friends and kids, and a reduced deposit. If you book a suite, you also receive a $200 internet credit and prepaid gratuities. When our travel agent went to book the cruise, we meet the select cruise and sail date criteria, but Holland America would not honor the promotion. Holland America does not honor any discount rates they offer to get a promotion such as Explore 4. You must pay the brochure rate of at least $1899 per person for the same cabin we booked at $1399 per person. Our travel agent argued endlessly to no avail. Buried pages deep in their literature, which took our travel agent a half hour to find, are all the exceptions. Before we stepped onboard, we had several other negative experiences with Holland America. 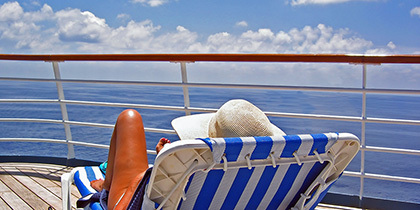 Most cruise lines reward past passengers with cruise fare discounts when they sail again. Not Holland America (unless you book another cruise while on a cruise). They devised the Mariner Society for past passengers. Their rewards are based on Cruise Day credits which you earn for every day you cruise and for each time you make an onboard purchase, such as dining in the Pinnacle Grill or a spa treatment. These credits help you increase your Mariner Star status and earn more rewards. For instance, you need 30 cruise day credits to be a two-Star Mariner. When you cash in, you don’t seem to get much for your cruise day credits. Two-Star Mariners are offered seven options such as a Champagne brunch, brunch upon boarding (which is usually available for all passengers) or sailing with a Mariner representative. Other cruise lines reward past passengers with cabin upgrades, discounted cruise fares or shipboard credits. Our disappointment with Holland America continued even before we got onboard. Our January 17, 2017 departure wasn’t anywhere near full. About two weeks before the departure, Holland America put out the word to travel agencies about big discounts to fill the remaining cabins. Online agencies were selling the cruise for $1299 per person for oceanview cabins ($100 less than we paid for our oceanview cabin) plus giving passengers pre-paid gratuities for two. Holland America’s suggested gratuities are $12.50 per person, per day. So for a 14 day cruise that’s an additional $175 per person savings. However, Holland America refused to give discounts to passengers who already booked that cruise. Holland America also refused to provide people who already booked the cruise another amenity such as free internet, prepaid gratuities or a shore excursion. Our travel agent fought to get us either the discount or amenity and the cruise line flatly refused to do either. To add insult to injury rather than give current passengers an additional discount, Holland America wanted to charge current passengers an additional $99 per person for a cabin upgrade which amounts to $198 per couple. The cabin upgrade wasn’t from an outside cabin to a veranda cabin. It was an upgrade within your category. So, if you had an outside cabin with a restricted view, they would upgrade you to an outside cabin with an unobstructed view. A week before our sailing Holland America contacted our travel agent and said we could get an upgrade for $59 per person. Rather than try to exceed expectations and appreciate their passengers, it seems like Holland America doesn’t care because they have their payment. In a very competitive cruise market, this seems like suicide. Celebrity was offering discounts up to 79 percent, shipboard credits of up to $200 per cabin and perks such as free gratuities, beverage package that includes alcoholic beverages or unlimited Internet. Book a suite and get all four perks. Norwegian - up to 86 percent off and shipboard credits up to $340 per cabin, two amenities such as a beverage package for two, specialty dining, internet time and shore excursion credit for oceanview cabins. Princess - up to 74 percent off, shipboard credits up to $685 per cabin, dinner in a specialty restaurant and prepaid gratuities for a balcony or suite. Royal Caribbean - up to 85 percent off and shipboard credits up to $175. Crystal - up to 77 percent off and shipboard credits up to $2,000 per cabin and air credit of up to $2,200 per cabin. Crystal fares includes gratuities, fine wines and spirits. Cunard - discounts of up to 74 percent, shipboard credits up to $860 per cabin and free gratuities. Suites also receive a beverage package for two. Clearly, there is formidable competition. Years ago I sailed on Holland America. Their service and food were considered higher-end. The cruise line policy at the time was no tips were expected or solicited. Judging by our experience with the booking process, Holland America has fallen far. Much has changed over the years. Holland America also missed the mark with airfare. Unless we have frequent flyer miles to cash in, we generally like to arrange our airfare through the cruise line. The cruise started in Hong Kong and ended in Singapore so a long-haul flight was involved going and coming home. Holland America’s lowest fares are on China Eastern Airlines. For such a long flight, we like to fly on a well rated airline. With an upcharge, Holland America had flight choices on Cathay Pacific, ranked five-stars and number four worldwide in 2016 by Skytrax. This is in contrast to three-star China Eastern. However, Holland America’s flight choices all included an overnight stay somewhere along the route coming and going. We didn’t have the extra time nor want to spend an extra $400 to $500 for hotel rooms, extra meals and transportation to/from the airport for overnight stays. We certainly didn’t want to sleep overnight at the airport. Our travel agent booked us flights on Cathay Pacific, but not through Holland America, that didn’t include an overnight stay. The cost was approximately the same as Holland America quoted. Holland America should have had the same flights available. We booked a 14-day Far East cruise that departed Jan. 17, 2017 from Hong Kong and ended in Singapore. We tried to plan which shore excursions we wanted to book during our cruise. The description, length, activity level and even passenger reviews were easily accessible online. Trying to find the price was a whole new level of frustration. After many hours of searching over multiple days, I finally found the price list. Thankfully, I saved the price list because when going back and trying to find it again, I couldn’t. When our Express Docs were ready at our online account, about three weeks before our trip, the shore excursion price list was finally easily accessible. As most cruise line excursions, prices are high. Their three-day Angkor Wat and Saigon excursion costs $2,899 per person based on double occupancy, or $3,349 for a single person. At the time of this writing, tour operator Gate 1 had a 12–day Vietnam and Cambodia tour during the same time frame which included accommodations, airfare, most tours (including three days at Angkor Wat) and some meals for about $2,200 per person based on double occupancy. If you take the Angkor Wat shore excursion through Holland America and add in the cruise fare of $1399 and the airfare and transfers from ship to airport of about $1500 this trip would cost $5799. That’s not including gratuities and excursions during the rest of the cruise. Our greatest take away from this experience was the itinerary itself. Sailing on a larger ship on the Vietnam Cambodia Thailand itinerary has it disadvantages. You have limited time ashore compared with a land tour from a tour operator such as Gate 1. For instance, a port of call is scheduled for HaLong Bay but there is no stop for Hanoi. Halong Bay is 3 ½ hours away from Hanoi and the ship is only in Halong Bay 7 a.m. to 11 pm. Therefore, you must choose between Halong Bay and Hanoi, you don’t get to do both. On a land tour you usually get both. Some land tours provide an overnight cruise along beautiful Halong Bay, compared to a three or four-hour Halong Bay cruise excursion you buy on a cruise. When you factor in excursions and airfare, land tours tend to be less expensive that cruises in this part of the world. Lastly, in many of our ports we had to dock at the commercial port which tends to be far outside of the town or city or you must tender in. Smaller ships can dock at places much closer to the center of town and the center of the action. For instance our itinerary included a stop at Laem Chabang for Bangkok. Unfortunately the commercial port is a 1 ½ to 2 ½ drive (depending on traffic) to Bangkok. Since all Bangkok tours factor in the cost of transportation from the pier to the city, tours are expensive. As a cruise ship passenger, cruise lines see you as a captive audience. Over the years sailing has evolved from an all-inclusive experience with a few optional costs such as beauty and spa treatments, alcohol and shore excursions. Now cruise lines try to enhance their revenues with optional services or products at every turn. There are too many cruise lines and tour operators that will deliver better value for your vacation dollar without all the frustration that we experienced. Even when the cabin is on sale, this particular Holland America cruise is no bargain. For what we ended up paying for this Far East itinerary, you are better off sailing on a smaller ship with a more intimate experience where many shore excursions and alcoholic beverages are included. The cost would be approximately the same. But for other Holland America cruises, it is good to have a strategy. According to Cruisewatch, a search engine that matches you with potential cruises, cruise companies use different pricing strategies and can be divided into two groups. The first group has flexible prices, while the other group offers more stable pricing. The cruise lines with flexible pricing quickly react to changing market situations. This flexibility allows them to balance supply and demand easily. It also allows them to offer cruise price reductions. The cruise lines with more stable pricing models prioritize stable and reliable fares. Cruisewatch’s research indicates that Holland America Line leads the group with flexible prices. Holland America offers an average 23 percent savings over the initial price. Bargain hunters can find a near 60 percent cruise price reduction. So if a Holland America cruise is in your crosshairs, you may not want to book early but wait until the price reduction is an amount you are willing to pay. Also understand that for the deeper discounts, Holland America will likely not honor any of their ongoing promotions. Hurtiruten Cruises will turn 125 years old and wants you to celebrate with them. They’ve added new offers and destinations. Here are some of their offers. Early Booking Offer – https://www.hurtigruten.us/norway-offers/norway-early-booking-savings/?utm_source=hurtigruten&utm_medium=email&utm_campaign=US_B2C_OffersEmail_07-06-177/6/2017&email=US_B2C_OffersEmail_07-06-177/6/2017 - Book a Norway cruise between Apr. 1, 2018, and Mar. 31, 2019, and save $100 per person on six- or seven-day cruises or $300 per person on 12-day cruises for Select and Platinum fares. Early booking can be combined with the child offer and the 1893 Ambassador loyalty program discount for past passengers. Midnatsol Suite Offer - Book a suite on one of three Antarctica cruises and save up to $2,000 per person or $4,000 per couple on mini suites and suites. Suite availability is limited and the offer expires two weeks before the departure date or when suites are sold out. MS Roald Amundsen Offer - Three ways to save on the world’s first hybrid-powered expedition ship the MS Amundsen. You can receive an airfare credit worth up to $1,893 per person, a savings of $500 per person. Or if you are a single traveler, you won’t have to pay the single supplement. Northern Lights Savings - Save 20 percent per person on cabin fare valid for travel Dec. 1 and Dec. 31. 2017. Book by Sep. 30, 2017. Or get an onboard credit of about $250 per person on six- and seven-day winter cruises or $415 per person on 12-day winter cruises. The offer is valid for travel Dec. 1 to 31, 2017 but must be booked by Sep. 30, 2017. The 12-day cruise is combinable with the Northern Lights Promise, and the onboard credit can be applied to shore excursions.